All the street names in this zone have their ori­gin in old loca­tion names, giv­ing inter­est­ing infor­ma­tion about the for­mer land­scape and its use. 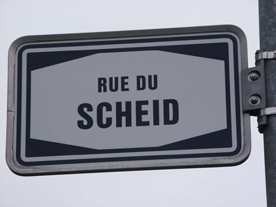 The “rue du Scheid” is the old term for the crest, sep­a­rat­ing the local­i­ty of Hostert and Ramel­dan­ge. 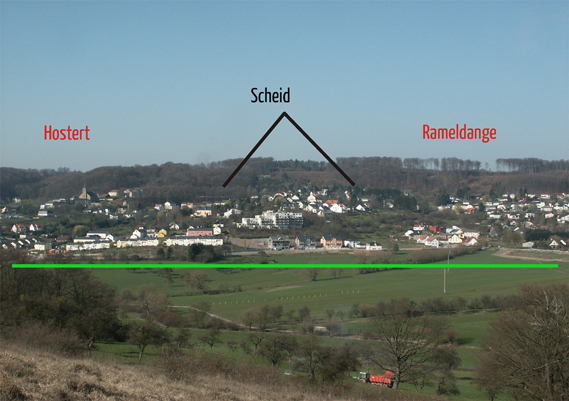 At the same time it forms the sep­a­rat­ing line of the water going to the basin of the Hostert brook on one side and to the basin of the “Boueschbach” on the oth­er. The site where the res­i­den­tial estate is today, had once been cov­ered by orchards. 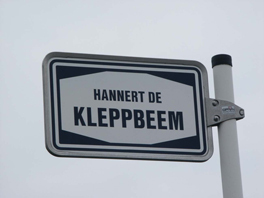 Both street names “Han­nert de Klepp­beem” and “Äppeltaart” remind us of its old use as an orchard. “Han­nert de Klepp­beem” means: “ behind the trees that can be beat­en”. In fact the branch­es of the apple or plum trees were shak­en or beat­en to har­vest the fruits. 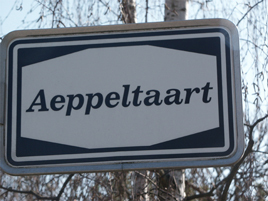 The name “Äppeltaart” sim­ply means apple pie and recalls the use of the fruits reaped at this loca­tion.